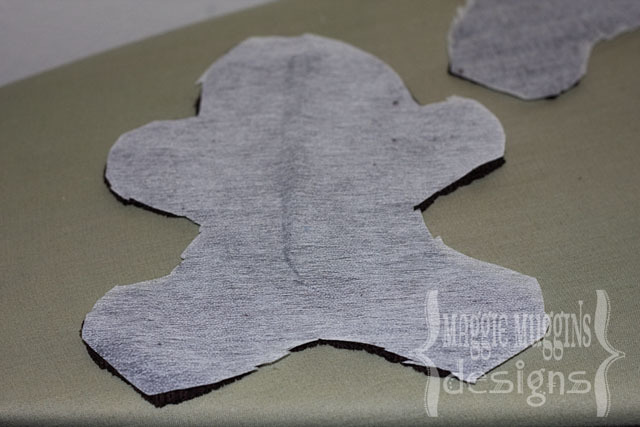 Maggie Muggins Designs: The Gingerbread Man - Free Pattern and Tutorial! 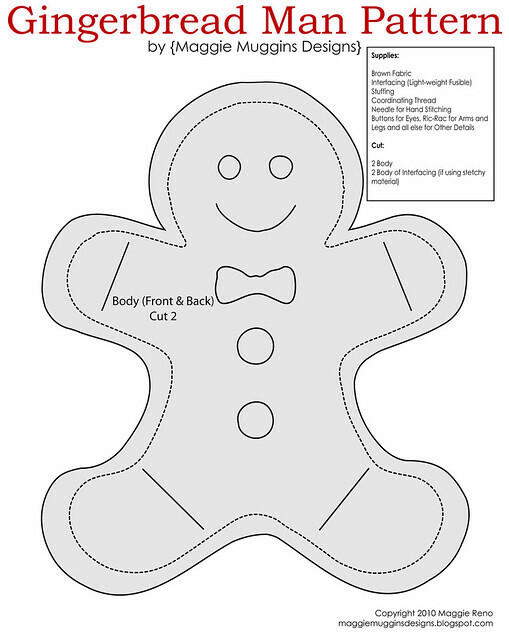 The Gingerbread Man - Free Pattern and Tutorial! Over a month ago I cleared out my closet of clothes I haven't worn in a long time or I was just bored with. A large bag went to our Value Village, but some of it stayed here, in another bag. It's yet another stash of fabric for me to have fun with. Only, this is more fun because I feel like it's free fabric so if I mess up it doesn't really matter. The first thing to come out of the pile was this brown sweater. 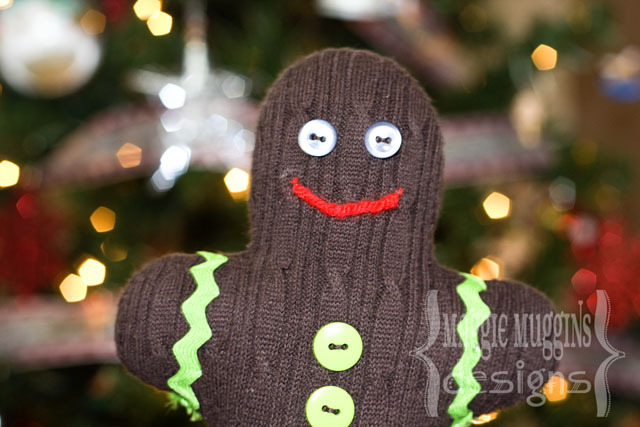 I was looking through the bag just looking for ideas and this one just seemed perfect for a Gingerbread man. I found some images, played around and created a pattern. Then I got to work cutting and sewing. 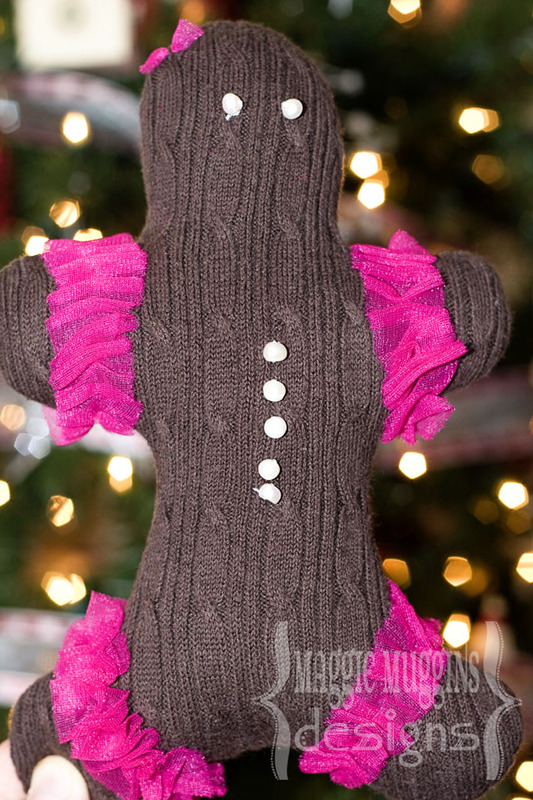 Wouldn't this be a perfect to wrap up with a book about The Gingerbread Man? My oldest son just about freaked when he saw his. His Gingerbread Man is currently running away from the Mean Witch (his cross between The Gingerbread Man and Hansel and Gretel ). Unlike a wool sweater that can be felted to make a cute stuffed animal, this one was machine washable, and had been shrunk already. 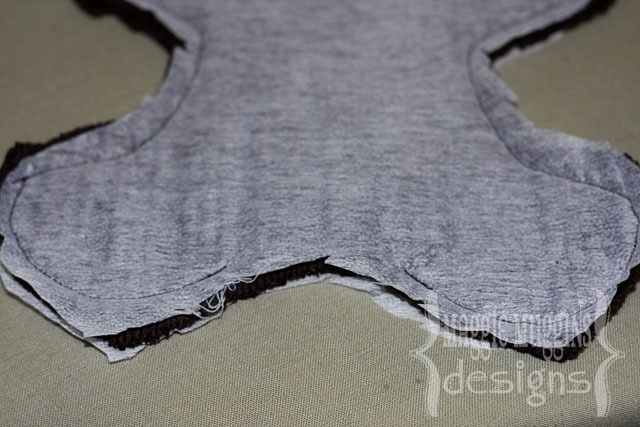 It had a lot of stretch so in order to make it work, and look cute, I cut out a light-weight fusible interfacing and ironed it on the back. 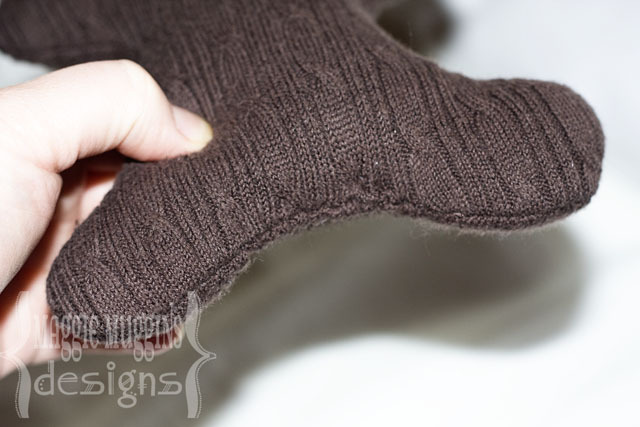 This will hold the fabric so it looks like a nice sweater and isn't stretched by the stuffing. You would probably want to do the same for any stretchy material. 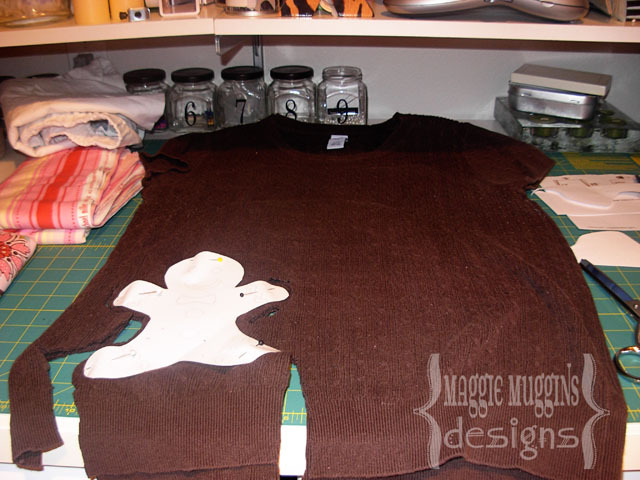 I cut four gingerbread men from one sweater. I made two boys and two girls. The girls I made to match the outfits I'm giving my husband's nieces. The boys are for my sons. 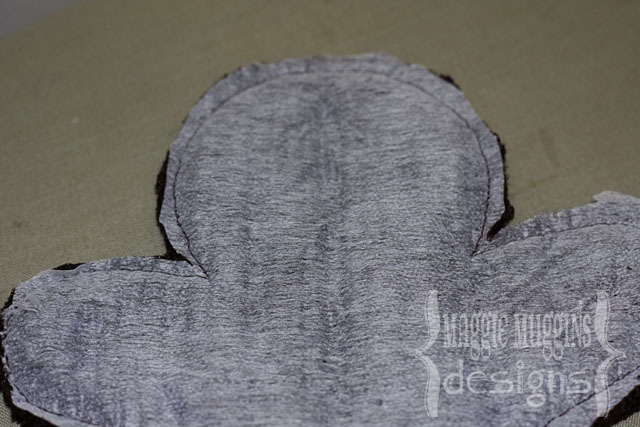 *The pattern is made for 8.5"x11" print but you can shrink it or enlarge it as much as desired. 2. Iron on the interfacing. 3. Pin right sides together. At this point, I pinned on the inner part of the pattern (dotted lines) to be my guide. It made it easier to sew and the final product looks a lot better. You could also trace the sewing guide onto one side. 4. 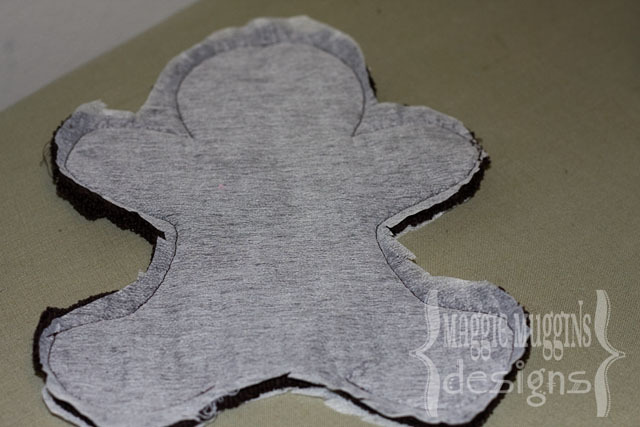 Following the sewing guide, sew around the outside leaving about a 1.5 inch opening at the bottom to pull the Gingerbread Man through. 5. 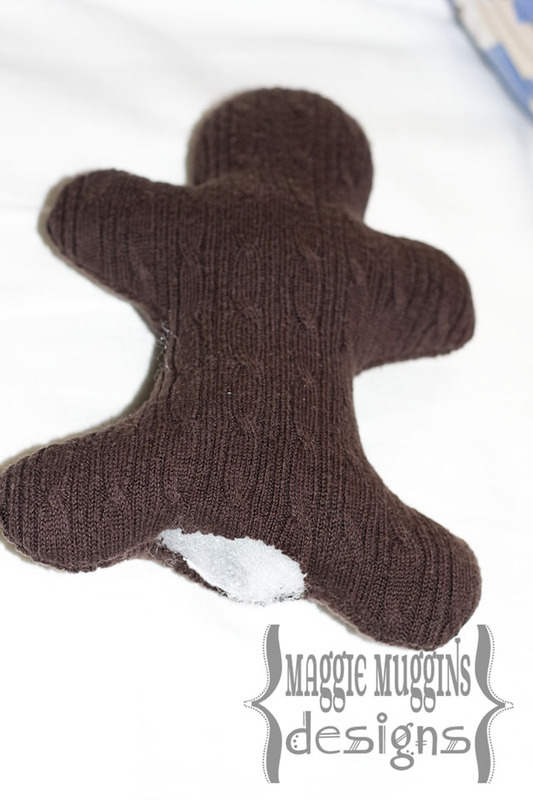 Clip the parts in between the neck and head close to the seam, trim excess fabric - then pull the right side of the Gingerbread Man out through the opening. 6. 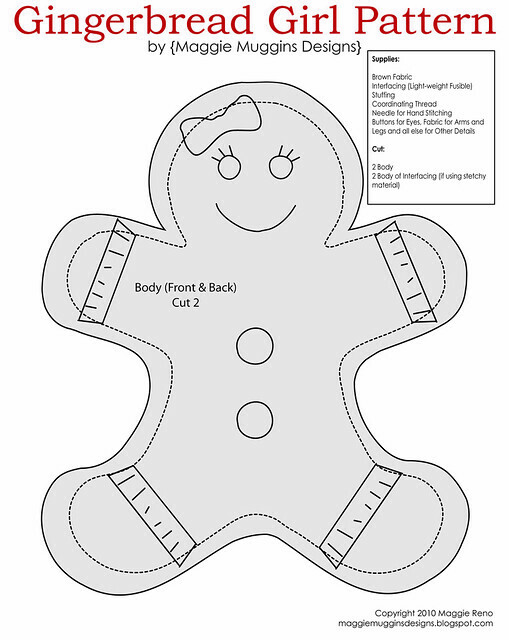 Stuff the Gingerbread Man and sew the opening closed. 6. 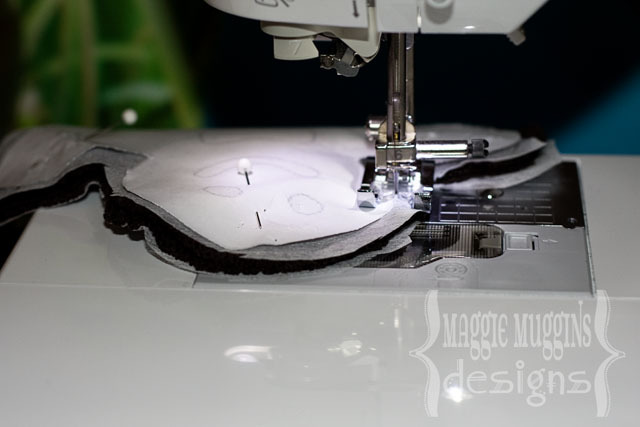 Sew on the details using your imagination. I've given you a guide on the pattern, but don't let that limit you. Buttons for eyes, ric-rac around the arms and legs for that "frosted" look, red yarn for the mouth to look like licorice, bright buttons and a bow tie, ruffle trim and a hair bow for a girl, whatever your heart desires. The girls ruffles were about 3/4-1" wide. I cut the entire width of the fabric and then cut that into 4 even pieces. I gathered the ruffles as I stitched the fabric on. It was really easy. The fabric is a non-fray nylon chiffon I purchased here. 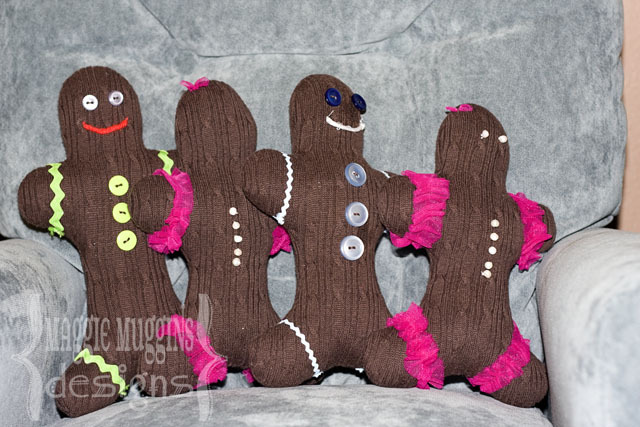 The Gingerbread Girls are for my husband's nieces. 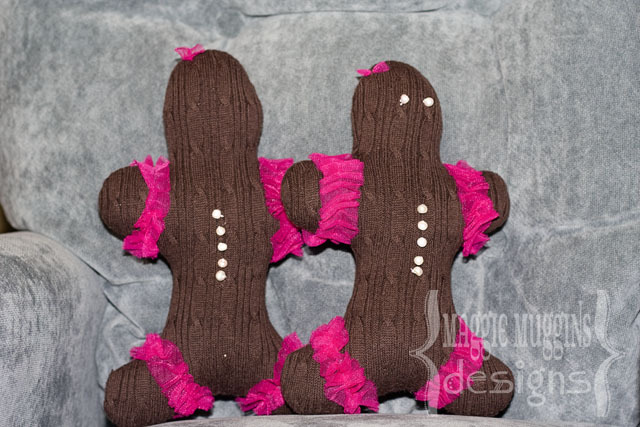 They are also getting cute little brown and pink tops that I found and skirts that I'm making. So I decided to use some of the fabric from the skirt and put ruffles on the girls. Adorable, no? I wish I could be there when they are opened. Vinyl Shifting on YOUR Silhouette?